Not only is this one one of the funniest films I’ve seen in a while, it is filled with both retro and modern day video game references that made me nostalgic for those Friday evenings at Peter Piper Pizza losing the feeling in my fingertips playing “Centipede.” It’s also just one of the forces behind the surge in popularity of 8-bit computer art. 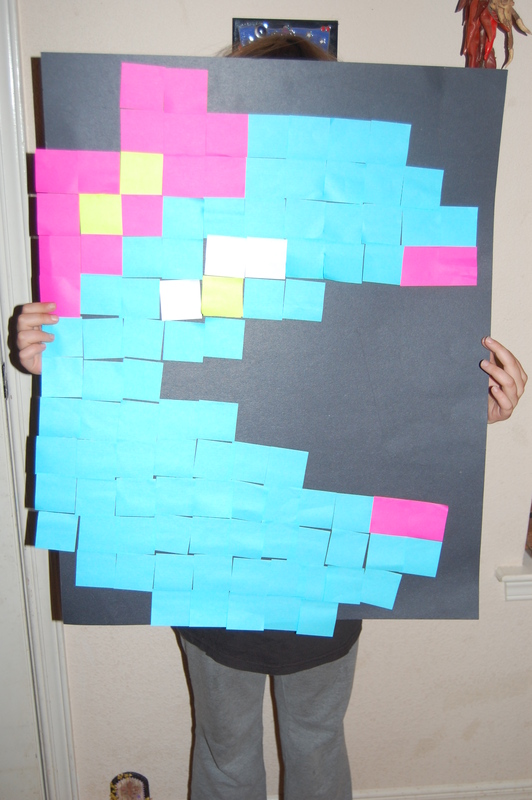 The classic Atari-era 8-bit look of “Pac-Man” and, more recently, “Minecraft” has popped up in everything from cross-stitch samplers to digital photography to beadwork and cutting boards (all of which, I have to say, yield pretty cool results). For those who don’t want to be left out of the 8-bit loop, here’s an easy way for you and your family to create your own 8-bit wall art using only using those small-size notes that no one ever needs for legitimate memos anyway. I’ve based this on the wonderful large-scale 8-bit note paper art that became a window-decorating craze among bored office workers in Paris, some of which was pretty elaborate making me both A) appreciate the artistic merit of the French and B) doubt their work ethos. 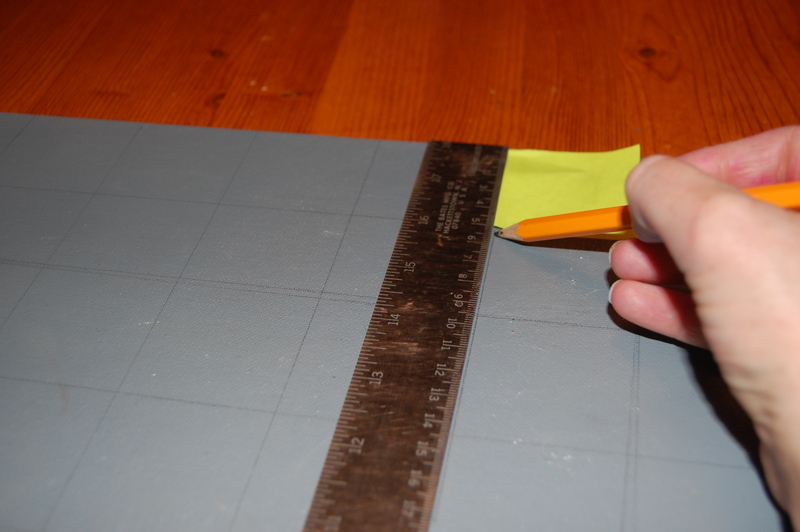 Step One: Using the note squares as a guide, take a ruler and very lightly draw a grid across the entire board. You don’t have to do this is you have a good eye for centering the art, but younger artists might appreciate a guide to go by. 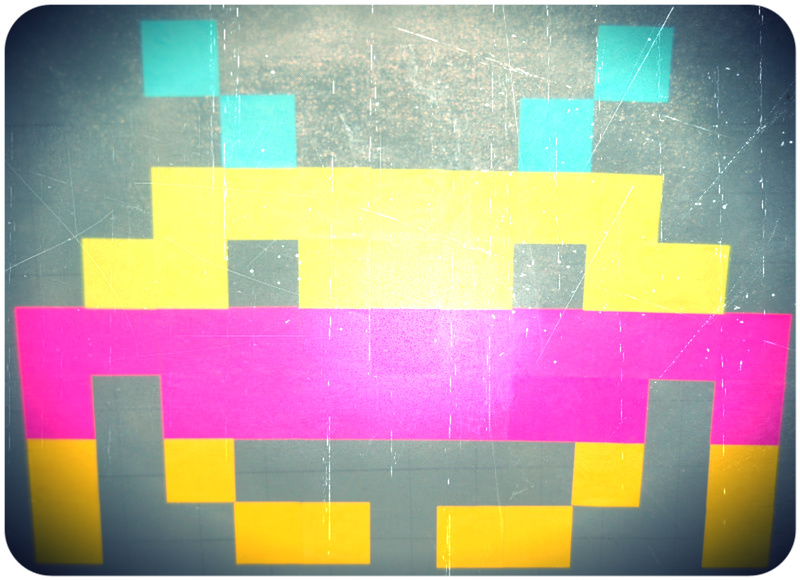 Step Two: Find some simple 8-bit art examples from games, magazines or online (Space Invaders, Pac-Man, Mario, Dig Dug, etc.). The simpler the better for the first time. 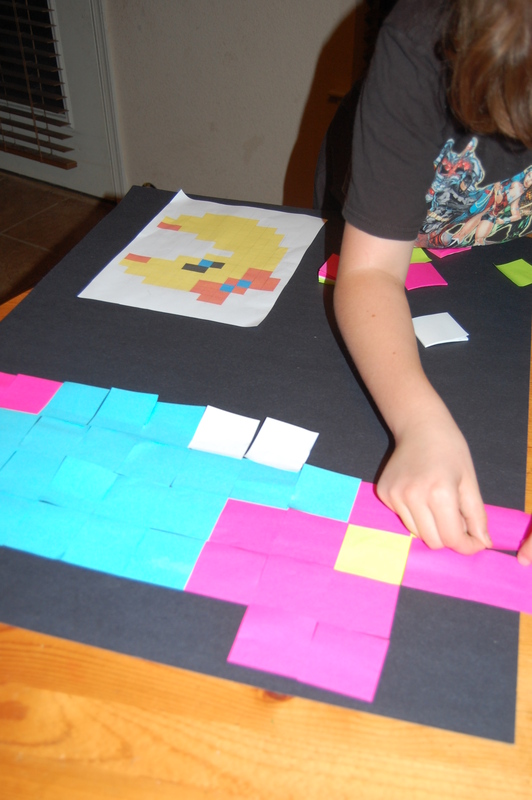 Step Three: Arrange the note squares on the poster board or canvas to match the image you’ve chosen. Count how many squares high or across to make sure it’s centered. The great thing is if you’re off a bit, you can easily remove the notes and re-set them in the right place. Step Four: Once your image is how you want it, take a little glue and tack down each square so it is secure in place. If you’ve drawn a grid, you can erase it lightly or paint over it. Since my daughter, Molly, and I took a look at their debut one shot, we decided to see if writer Patrick Rieger and artist Mark Sean Wilson could keep their momentum going with a two-issue story. On this second visit to this alien vacation hideaway, “La Galatique,” Tim and Russ have settled happily into their status as intergalactic bellhops, but enter Eleanor, a ‘tween alien-hunter who’s mom just happens to be the town’s Chief of Police. When they come to inspect the hotel, the boys’ lot goes from fun to frantic as they try to keep the guests properly hidden from prying eyes (such as fixing mind rays and breaking up luaus) and maintaining some human dignity in the process. Needless to say, it ain’t easy. Still exceptionally funny with humor that will both appease the “visuals-happy” young reader set and a some word play that will amuse the seasoned geek. I’ve actually had a similar “zombies vs. ghosts vs. aliens” exchange with friends. The addition of new characters in the main story — and many, many new characters in the background — did give me the optimistic impression Rieger and Wilson want to keep building and improving upon their world. Parents appreciate that when their kids ask them to shell out bucks repeatedly for the same comic title. I’m also a sucker for extras, and the inclusion of a kid-friendly puzzle and little “thank you” letter to readers was a nice touch. 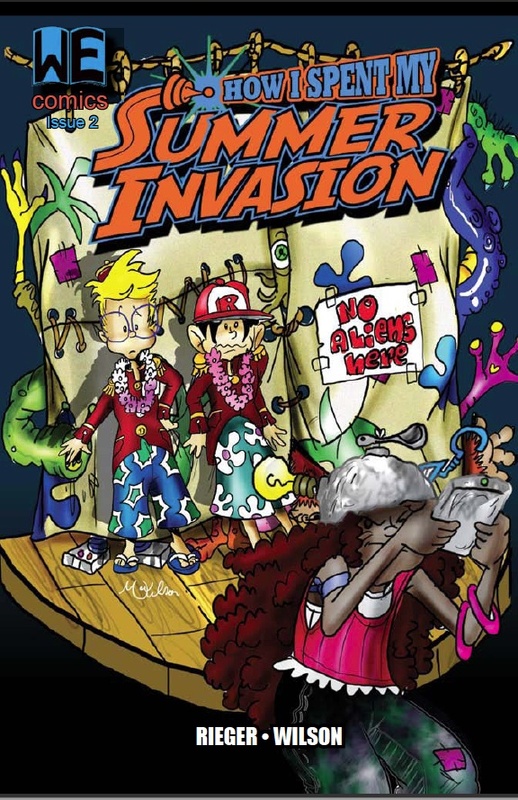 The artwork remains colorful, fun and filled with little details that will inspire readers to go back and look at the pages more closely (I dug the little “tiki alien” hidden among the poolside guests and would like to see a story line featuring him). Not really anything to complain about, as this book gets the job done on being a quick and fun read, but I always tend to nitpick in the design area. I would have liked to see a clearer, comic font used in the main story text, as this chosen one (forgive me for not knowing what it is) seemed a little too thin, blurry and sometimes hard on the eyes. A simple sans serif like “Legendary” might fit well with the fast-paced nature of the story. As far as characters, the introduction of Elly as a foil for the boys is great, but I wanted just a comment or mention of the inaugural issue’s plotline (i.e. what might have become of Starlei), just to remind the readers they aren’t leaving any unattended plot holes in the future. I thought it was actually pretty funny, you know, just the way they were trying to do everything at once and it never worked out. One of my favorite parts was when (Tim) yelled “We’ve got rats coming up the stairs” and this big rat alien said “No Way! Cousin Jethro are you there?” That was sooo hilarious. I also like the puzzle at the end, too and think they should do that more often. The new girl (Eleanor) was a little weird, though. She kinda thought she knew everything and it was sort of annoying. Also, I like the surprise ending. It makes me want to find out what happens next. There you have it, two issues in and holding its own among its readership. Good work, boys! As a longtime denizen of the Southwest, the traditions of Mexico run heavy, and my favorite has to be Dia de Los Muertos, or Day of the Dead. What better way to kick off November, and wind down from Halloween than with skeleton-themed cosplay and parties in a graveyard! There is actually more to it than that, but for my story purpose, I’ll keep it brief. Here’s the dime store low-down on what Day of the Dead is, for those still not sure: “Dia de Los Muertos” is Latin America’s answer to All Soul’s Day. In Mexico, Dia De Los Muertos has been part of the Mexican cultural landscape for at least 3,000 years, and has elements of both the “pre-Hispanic” indigenous cultures who displayed various items during certain rituals to symbolize death and rebirth. It is also infused with Christian elements, particularly as it falls at the time of the Catholic observance All Saint’s Day on Nov. 1 in honor of all saints, known and unknown and All Soul’s Day, Nov. 2, the Catholic celebration of the faithful departed. Some of the most powerful imagery that floats around includes the “Calaveras” (skeletons), and “Calacas” (skulls), and can be found on items like “Pan de Muerto,” a pastry served during the observance, as part of elaborate costuming and face-painting (like those in Catrina Balls), cut in to tissue paper decorations known as “Papel Picado” or in the form of sugar skulls placed on home-made altars in cemeteries and community centers that honor a departed loved one or historic figure. See, the key is really as long as there is someone to remember your name you are never truly gone from this earth. Both sweet and a little eerie, but it makes for a really cool party. Got the basics? Good. Now for the fun part —Day of the Dead-style imagery can be found through the geeky realm of pop culture, and I’ve put together some of the best places to find it. The Crow: City of Angels. Admittedly, this 1996 follow-up to the original Brandon Lee film was pretty lame in comparison, but it takes place in Los Angeles during the Day of the Dead celebrations with a pretty cool processional scene that captures the mix of celebration and mourning. Corpse Bride. “Nightmare Before Christmas” may be more famous, this stop-motion animation Tim Burton film really nails the Day of the Dead psyche. The dead are celebratory and lively, while the living are morose, colorless and downright unhealthy. Worth a watch for the Danny Elfman-voiced Mr. Bonejangles character, if for no other reason. “El Muerto: The Aztec Zombie.” Javier Hernandez’s hero debuted in 1998, and follows the exploits of Diego de la Muerte, who was abducted and sacrificed to Aztec gods on his way to a So-Cal Day of the Dead event. He returned a year later with supernatural abilities including regenerative healing and the power to give…or take life. 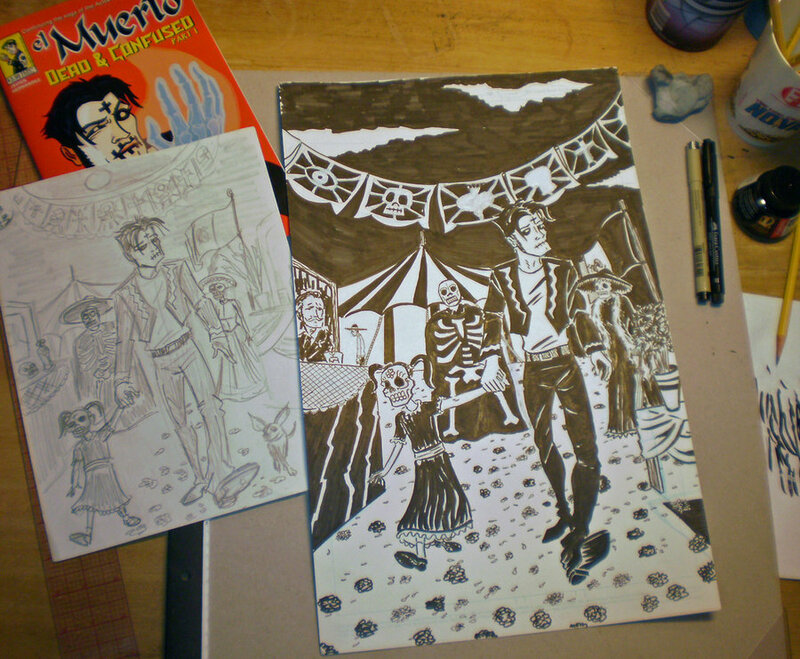 Much of Hernandez’s work is in itself a cool shout-out to Day of the Dead, and “El Muerto” has built up quite a cult following. It was even made into a schlocky horror directed by Brian Cox in 2007 starring Wilmer Valderrama in the title role. Apparently, when the chosen one arises on Day of the Dead it will be…Handy Manny? Hernandez’s comics, and the movie can be purchased through his official webshop at loscomex.storenvy.com. Sergio Argones’s “Dia de los Muertos.” In 1998, Argones (“Groo,” Mad Magazine) and Mark Evanier put out this Dark Horse humor one-shot poking fun at the American fascination with this centuries old tradition. It’s actually pretty educational, too. Not that easy to find, but you might be able to pick up a digital copy from Dark Horse or best bet peruse those discount comic bins. Black Star Fiction Library’s #2: This UK comic company’s comics set in Big Star City’s second issue took place during Dia de Los Muertos. Interesting to see European take on this observance. The issue, written and drawn by Shaky Kane, was released in August and might still be out and about on the indie comic shelves. Grim Fandango (video game): LucasArt put out this film-noir meets Day of the Dead game in 1998 following the adventures in the happy afterworld. Great visuals, quirky humor and fun little story make this one worthwhile as it isn’t particularly challenging. If you can still find a copy of it used somewhere. Oingo Boingo’s “Dead Man’s Party” (CD): The name says it all. Great song and great album by the Danny Elfman-fronted band, but the cover photo of the kitschy, garishly colored party-hardy skeletons on this is so perfect for the occasion. It is exactly the like the little dioramas I see in every curio and tourist trap around these parts, but it is so fun you can’t help but want one! Los Lobos’ La Pistola y Corazon” (CD) Even if you are not into this band’s style of music, this is one of the coolest paintings to adorn an album cover. This pair of Mexican lovers in true skeletal form is a perfect example of the costuming often accustomed with Catrina Balls. I was able to see the actual painting of this by L.A. artist George Yepes with Cheech Marin’s traveling Chicano art exhibit a few years back, and it is amazing in its original glory. Now that we’ve explored some of the imagery, it’s time to create your own simple papel picado decoration to hang up year-round! 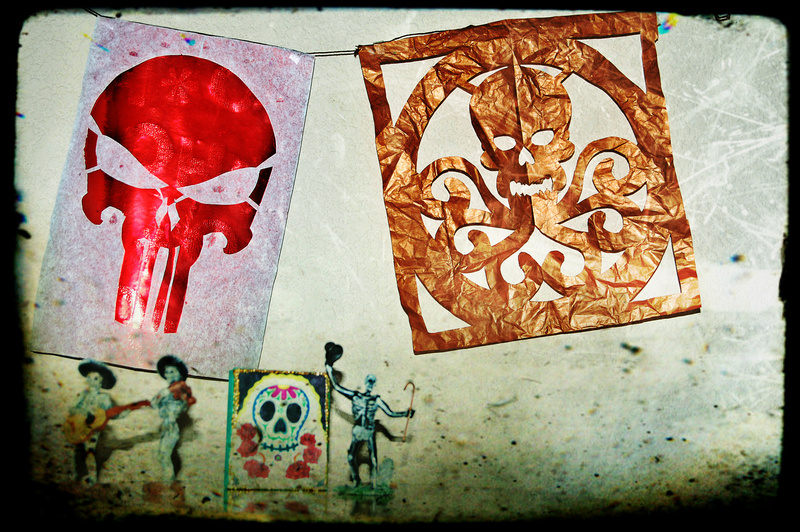 Usually, these designs are mega-elaborate, but I’ve simplified them to easy paper-doll status for beginners, using two of my favorite geeky “Calacas” patterns — The Punisher’s symbol and Hydra logo. Print the attached templates out and fold a 8” x 11’ piece of tissue paper in half as you would a Valentine, then gently cut over the pattern with an X-acto style knife or small scissors. Now hang it up and consider yourself cultured.